Atlanta-based Charmaine Minniefield’s work explores feminism and African and African-American rituals, and she teaches at Spelman College. For her wall mural along Monticello Road, she painted a garden representing growth. Savannah Taylor’s bright yellow sweatshirt and smile light up the Indie Grits Lab house, and her calm masks the chaos of the days filled with frantic phone calls and rapid-fire decisions leading up to the annual Indie Grits Festival. It’s the week before the festival bursts onto the Columbia arts scene with four days of Southern film, music, visual arts and food. Taylor and her team are always on their feet pinning up a picture or making sure one of the many pamphlets and guides has been printed. Taylor, resident graphic designer for the Nickelodeon Theatre and Indie Grits, says the preparation takes quick thinkers with a backup plan who are always ready for something to go wrong, because, according to Taylor, it always does. This year’s festival, the largest in its 12 years, made preparation even more difficult. Browse the Indie Grits website for ways to get involved in next year’s festival and participate in year-round programming. Listen to more about Indie Grits and its history in this podcast from the National Endowment for the Arts. Check out Atlanta muralist Charmaine Minniefield’s personal site for more information about the artist and her work. The festival added the year-round “Two Cities” art projects and events at the renovated Indie Grits Labs house on Duke Avenue in Eau Claire. 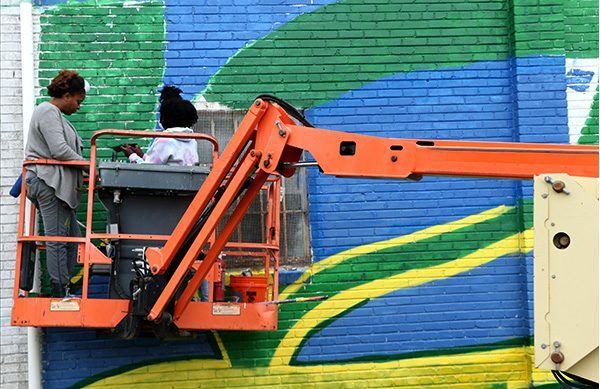 Atlanta-based muralist Charmaine Minniefield also was painting a wall-sized mural on the side of a Monticello Road building. 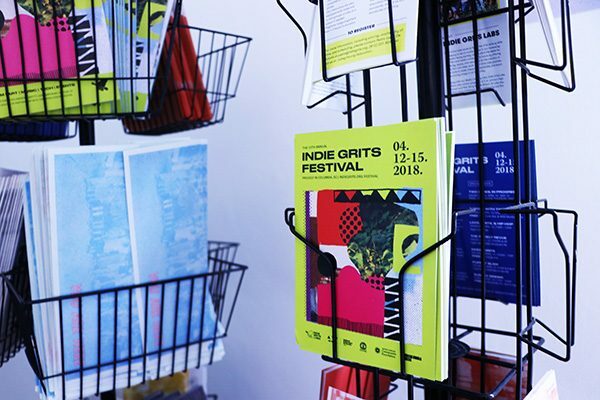 Indie Grits is a haven for regional artists wanting to get their work showcased as well as for lovers of art, film, music, gaming and design. Click on the photo below for a slide show as Taylor takes us inside the Indie Grits Lab house leading up to the festival. The Indie Grits Festival headquarters is now at 1013 Duke Ave. in Eau Claire. This gives the festival a year-round location to display art and so people can walk through and pick up Indie Grits literature and artwork.